After having taken “The Queen of Europe’s Rivers” down to her steel structure, Crystal River Cruises introduced a vessel in July of 2016 that is as beautiful as it is innovative — and it was all done in an extremely crunched timeframe. 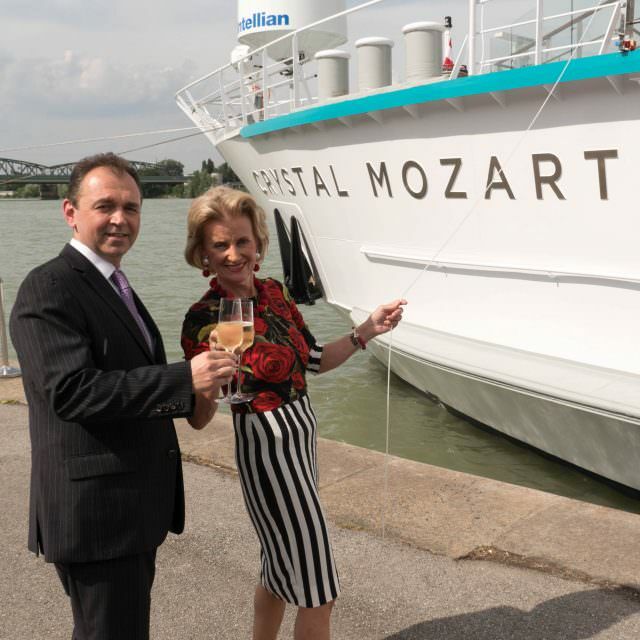 It was late last year when Crystal announced the purchase of Dertour’s 1987-built MS Mozart, which was formerly operated by Peter Deilmann and TUI Cruises. At the time of her construction, Mozart was one of the largest river vessels afloat and easily recognizable thanks to her unique semi-catamaran design. She remains one of the widest river cruise vessels (nearly double the width of most river cruisers), and her increased dimensions mean that she can only sail the Danube between Passau and the Black Sea. Transforming Mozart took more than 400 shipyard workers going at it around the clock. “We went through every single inch, both technically and from a hotel point of view,” says Crystal Cruises COO Thomas Mazloum. “We had 14 different contractors, two to three different designers, working the last couple of months in three shifts, 24 hours a day to get it finished in time. I stepped on board a ship where few vestiges of the nearly three-decade-old vessel are to be seen (I had sailed Mozart under Peter Deilmann in 2009). There were a few portraits from the old Mozart, and a beautiful Bösendorfer piano that was almost scrapped but rescued at the last minute. Lovingly restored, the piano is the centerpiece of the forward-facing Palm Court on deck three. Throughout Crystal Mozart elegant furnishings adorn public areas that will be familiar to those who have sailed Crystal Cruises’ two luxury ocean ships. The Bistro, the Cove and Palm Court, for example. 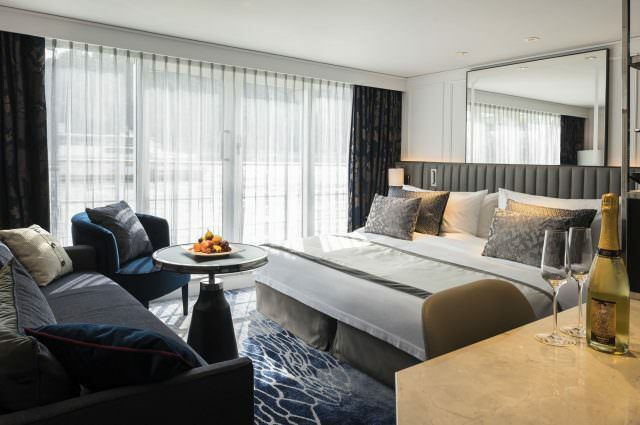 Staterooms and suites carry familiar amenities: Crystal bathrobes and kimonos, Etro toiletries and even Crystal-logo shopping and laundry bags similar to those that you will find on Crystal Symphony or Serenity. Those familiar touches are complemented by new technology: USB outlets beside beds and at the desks, iPads that serve as Digital Directories for guests, and more. Lots of real estate. At 22.85 meters (75 feet) across, Mozart is nearly twice the width of the standard river cruiser. That extra width allows for a lot more in terms of public rooms and generally larger staterooms than you might find on the standard river cruiser. Being on Mozart felt like being on a small luxury ocean-going vessel. Pre/Post Stays. Crystal River Cruises will use Mozart as the hotel for pre/post stays in turnaround destinations such as Vienna. Crystal Trained Staff. Crystal hires, trains and manages its own staff, instead of contracting food, beverage and hotel operations to third-party companies. Switzerland-based Scylla, for example, manages Tauck while Sea Chefs manages ships for many other companies. “We did not outsource anything on this ship,” Mazloum says. “Everyone is a Crystal employee. They were hand-selected and interviewed for months and months.” Some are ex-Crystal employees, he adds, who were looking for opportunities on the river. Highest staff-to-guest ratio in the river cruise industry. Mozart has a guest capacity of 154 passengers served by 92 crew. Unique public areas not available on other river cruisers. 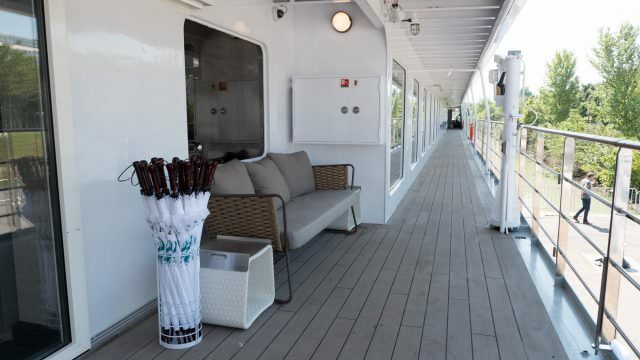 The uppermost deck, Vista Deck 4, features a pop-up bar that lowers flush with the deck for passing under low bridges. On deck 2, the Crystal Life Spa features an indoor pool and fully-equipped fitness, spa and salon facilities. Michelin-dining program. Off the ship, guests can choose to dine in one of nine Michelin-starred restaurants at no additional cost once during each cruise. In each restaurant ashore, there will be no more than 16 Crystal guests. Mazloum told me that Crystal wanted to keep it from becoming a banqueting experience. Many other river cruise companies provide equal (or better, in some cases) inclusives in their cruise fares. 24/7 room service and butlers for every stateroom and suite. Scenic also has 24/7 room service and butlers. Uniworld has butlers for suites. Prepaid gratuities for all shipboard staff including housekeeping, bar, dining staff and butlers. Emerald Waterways, Scenic, Tauck and Uniworld include prepaid gratuities, and many also include gratuities for tour guides. Unlimited soft drinks and premium beverages including champagne, fine wine and spirits. Scenic, Tauck and Uniworld include the same. CroisiEurope also include beverages but not premium brands free of charge. 24-hour Wi-Fi access (via satellite) including free Wi-Fi/Internet usage of 60 minutes per person, per day. Nearly all river cruise companies one-up Crystal by offering unlimited internet usage. Crystal argues that it wants to control bandwidth quality by limiting usage to one hour per day per person. AmaWaterways offers unlimited internet usage with no performance issues in my experience. Complimentary airport transfers between the airport and ship. All transfers will be group transfers by motor coach on embarkation and debark days only. Emerald Waterways, Scenic, Tauck and Uniworld also include transfers. Other companies provide transfers if guests purchase their air packages from the cruise line. Crystal Mozart features four dining venues (five counting room service). Three are open for breakfast, lunch and dinner (the Vintage Room is for special occasions and events). 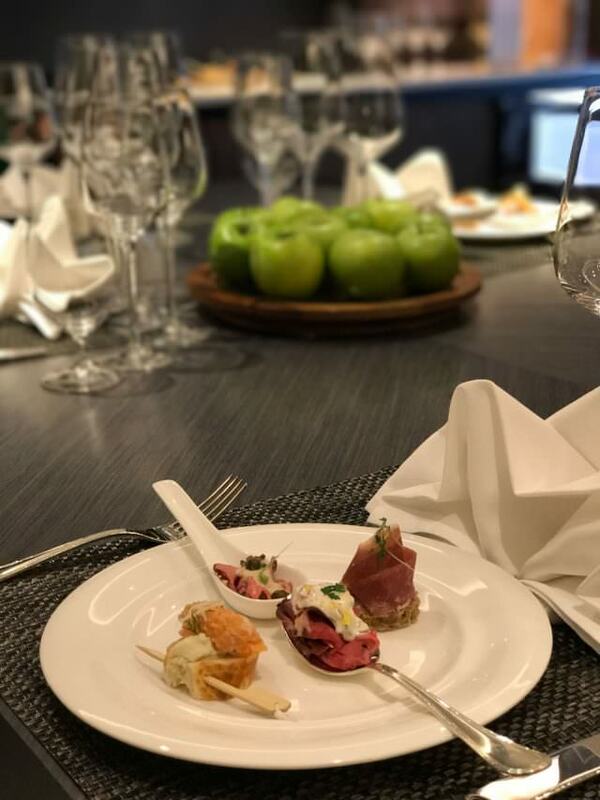 Chef Toni Neumeister, vice president at Crystal Cruises, has done a phenomenal job in preparing menus that are both tasty, Instagram-worthy and inspired. Waterside: The main dining area serves elaborate breakfast and lunch buffets, followed by upscale evening dinner service. Blue: This aft indoor dining area will offer a casual atmosphere and a menu of global comfort food, similar to Tastes aboard Crystal Serenity. Bistro Mozart: The go-to spot aboard Crystal vessels for freshly baked pastries, fruit and snacks, plus coffee, espresso and tea, Crystal Mozart’s bistro serves light bites throughout the day, including light dinners. The Vintage Room: As aboard Crystal’s ocean ships, the intimate dining room for approximately a dozen guests will host winemakers’ dinners and special occasions. Category CS Suites are the largest suites onboard Crystal Mozart, or anywhere else on European waterways. These Two Bedroom Crystal Suites with Panoramic Balcony Window can sleep up to four adults (minimum double occupancy) in 883 square feet of unabashed splendor. The Master Bedroom includes a King-size bed facing the windows; a walk-in closet; bedstands that have wireless charging capabilities; an arm chair; and an interactive television system. In the bathroom, a double vanity complements the stand-up shower with wand and rainforest settings, stocked with ETRO robes and slippers. The living room features two arm chairs and a coffee table, an entry vestibule, and even a fireplace (faux) below a second mounted flat-screen television set. Butler service, naturally, is offered to guests in these suites. Category CP Suites are the second-largest accommodations, coming in at a healthy 664 square feet. These One Bedroom Crystal Penthouse with Panoramic Balcony Window suites can sleep up to two guests and offer all the amenities of the larger Category CS Suites, minus the second bedroom. Penthouse PH Suites are smaller but still spacious. At 330 square feet, this category features all of the amenities above, but offers a French Balcony, opposed to the panoramic balcony window. These suites can host up to three guests, with a convertible king bed and pull-out sofa. Category S1 and S2 Suites are smaller still, but no less comfortable. Ranging in size from 204 to 219 square feet, these rooms look more like classic boutique hotel rooms than your typical river cruise ship accommodations. Impressively, these rooms also feature many of the same amenities that their larger (and more expensive) counterparts do, from full butler service to nightstands with wireless charging capabilities, king-sized beds and ETRO robes, walk-in closet, an in-suite Nespresso maker, and a 40-inch interactive television set. These categories feature a French balcony. Category W1 and W2 are the entry-level accommodations onboard and can sleep up to two guests in 188 square feet of living space. Smaller but no less deluxe, these rooms still include butler service, ERTO robes and slippers, an in-suite Nespresso maker, wireless charging nightstands and a 40-inch interactive television set. These categories feature fixed windows. Crystal Mozart gets high marks for many reasons. First, she’s wide, and that gives Mozart advantages: lots of space for including features not found on other river cruisers, such as the indoor pool, the wrap-around promenade, multiple dining venues unlike those on other river cruisers and expansive public rooms. Also, Crystal’s approach with its crew is different than on other river cruise ships. Crystal hires, trains and manages its own crew. Are they better than the crew on other ships? Debatable. However, what’s not debatable is the highest staff-to-guest ratio. Will that make a difference in your experience? Possibly. Included Michelin-star dining ashore is a plus, as is the two Wider-brand boats for excursions and events along the river. All in all, Crystal River Cruises has a winner on its hands with Crystal Mozart, truly one-of-a-kind, the “Queen of Europe’s Rivers,” or at least of the only river it sails on currently, the Danube. Crystal Mozart features 110/220V outlets in all staterooms and suites. Although Crystal Mozart has an elevator, it does not travel to the uppermost Vista Deck.